Installed in November 2009, the 99 meter wide and 78 meter long media façade on the face of Seoul Square is the world’s largest and it may soon be listed on the Guinness Book of Records. Media works by five more artists in addition to Opie and Yang -- Mun Gyung-won, Kim Shin-il, Ryu Ho-yeul, Lee Bae-gyung and group mioon -- colorfully light up the 42,000 LED light bulbs dotted on the façade everyday until 11 p.m. Since Tuesday, a new show titled “Seoul Square Clock Project” has been added to the playlist. Nine graphic artists -- Cho Young-sang, Lee Gyu-man, Park Jeong-sik, Kim Ji-seon, Seok Chang-geon, Park Ho Yeon, Won Ki-hun, Gang Se-hyun, Mun Yong-ho -- created 7 minute-long-works inspired by time or clock. The works are showcased every 59 minutes past the hour. “Composed of various numbers and clock motives, the art clock offers a unique visual experience. It will also work as a convenient public clock,” said Yeom Yeon-hwa, an official at the Seoul Square Media Center. Many buildings throughout the world are competitively having media façades installed on their outer walls. The most famous ones like Dexia Tower in Brussels -- which used to be world’s largest until Seoul Square came along -- Millennium Park in Chicago and the Chanel building in Tokyo have all become the cities’ newest landmarks. 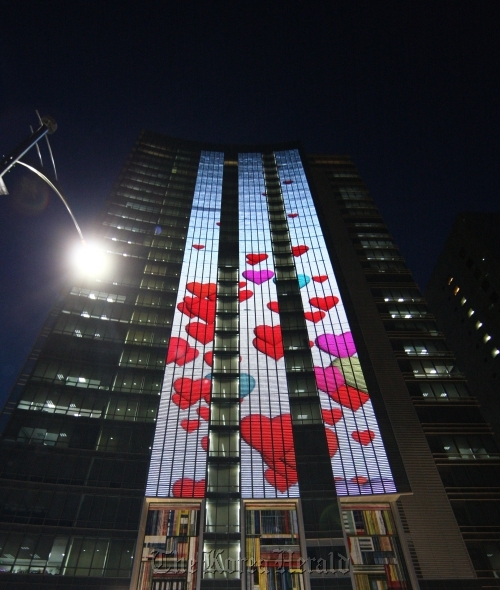 Led by Seoul Square, buildings with big and small media façades are rapidly becoming landmarks in Korea as well. Bus and taxi stops in front of Seoul Station on which eye-catching media art flows continuously is called “Art Shelters.” It is a donation by Hyundai Card to the public to add to the area‘s brilliant ambience created by Seoul Square. Kumho Asiana Main Tower in Gwanghwamun literally shines among buildings in the area with its 91.9 meter long and 23 meter wide media façades titled “LED Gallery” on its front side. In southern Seoul, many buildings including GS Tower in Yeoksam-dong and Galleria Department Store in Apgujeong-dong light up the area. Lotte Department Store’s Gwangbok branch became one of the landmarks of Busan as soon as it opened in December 2009, not only for its unique design, which resembles a ship, but also for the media façade which covers all of its outer walls, consisted of 400,000 LED bulbs. In Sangam Digital Media City, which is Seoul Metropolitan Government’s ambitious digital media entertainment business cluster project in northwestern Seoul, six out of 22 buildings have media boards installed on them. It is actually mandatory for companies that plan to construct buildings near Digital Media Street -- the main street in the DMC -- to install media boards on the outer walls. “The purpose is to raise the brand value of DMC by showcasing something that only DMC can do. As each company has different functions, each media board will be designed to fit different identities of the companies,” said Jin Jae-hun, head of the DMC Management Team. This media façade craze is welcome news for media artists, who were not so popular in the art market compared to artists of other genres. It is likely that they will be offered more opportunities, according to art insiders. “The media façade on Seoul Square was made to showcase media art. We display contents made by artists and graphic designers. This could lead to great opportunities for the artists,” said Yeom. Building owners also benefit by adding such artistic touches on their buildings. “The building becomes a landmark when a media façade is installed on it. It is great PR. Then the occupancy rate of the building rises, leading to profits. The occupancy rate of Seoul Square actually jumped soon after Morgan Stanley bought the former Daewoo building -- today’s Seoul Square -- and installed the façade,” said Kim Min-ju, president of Read & Leader Consulting Corporation. Media façades usually consist of LED lights which are less bright than lights used on regular electronic display boards. “When comparing the same color, the brilliance of LED lights is less than one-tenth of the same lights used on regular electronic display boards. They do not make eyes sore nor cause harm to the buildings nearby,” said Yeom. “I really like working near Seoul Square. It was difficult to make time to enjoy artworks in the city, but now the media façade offers some great things to see on my way home from work,” said Lim Jae-wan, an office worker who works in a building near Seoul Square. However, some still voice concern over light pollution. Acknowledging such complaints, Seoul Metropolitan Government announced the Media Façade Guideline on Sept. 1, 2009. All buildings that are to install media facades have to pass deliberation council by the city. “Now is only the beginning of the media façade trend. We expect to see many more in the future, and it would not be a pretty sight if media façades were imprudently installed everywhere and the city overflowed with flashy advertisements. The guideline aims to have artistic and emotionally satisfying media façades in the city which do not cause harm to the drivers or the pedestrians, cause light pollution or spoil the beauty of the city,” said Lee Myung-gi, head of the Public Design team at Seoul Metropolitan Government. “Some buildings that use media façades for advertising were already built before the guideline was announced. In the case of BK Dongyang Plastic Surgery Clinic in Sinsa-dong, for example, we told them to make adjustments to the content of the media art and they brought a new design draft. We are currently reviewing the draft,” said Lee. But opinions are divided concerning the formation of the deliberating council members and how exactly artistic value could be evaluated. The deliberating council currently has 13 members -- 12 lighting experts and one media façade expert. “It is a sensitive matter, but we do sometimes think that it is illogical for lighting experts to give assessments about artworks, especially when artistic values are supposed to be subjective,” said Yeom. “Some of the deliberating council members are lighting experts but there is also a media façade expert, Chung-ang University professor Kim Hyung-gi who studied media facades in Paris. We are planning to have one more media art expert to join the council on January, although the lighting experts also do have basic knowledge about media facades. And media arts on the facades do not necessarily have to be ones by professional artists. Only if the works are not detrimental to the public interest, there is no particular reason they could not pass the deliberation,” said Lee.